Laura is looking for names for these patterns, two separate names, but that are linked to each other, or play off each other. She’s offering a free pattern as a prize, so get your thinking caps on! The patterns will be available soon, and we’ll try to coordinate with Laura so that we have a good selection of solid colourways in Elinor and Jeannie, suitable for the pattern. Maybe we’ll have a knitalong on the Posh Knitters Ravelry group – I know I definitely want to knit a pair of these socks!!! So, what names would you give them? Where on earth did this week go?! Things are a bit hectic here at the moment, for various reasons, and I haven’t had much time for blogging. Sorry about that! But I wanted to pop in this morning to tell you about a lovely project that one of my customers designed. 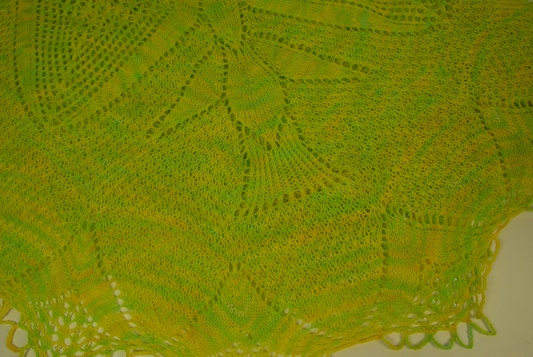 It’s called Lucky Clover, and it uses 1 skein of Posh Yarn Elinor. I think it would also look gorgeous in Sylvia 4ply, Daisy 4ply, Miranda 4ply, or Martha. The design is really appealing, simple enough for even a lace newbie, but with enough detail to keep it interesting. And to make it even more appealing, for the months of July and August 2010, the designer is donating $5 of the purchase price ($6) to Cancer Research UK to support her fundraising 10km Race for Life on 31 July. My trust sidekick Emma is off work sick this week, so I’m playing first base, second base, third base…… so, this is just a quickie blog post. Visiting: Ute Von Cappeln, one of our customers who makes delightful soaps. Reading: The Blackstone Key. If you like stories like Jamaica Inn you will love this. Watching: The Big Bang Theory, season 3. Love, love, love Sheldon. Listening: Jubilee, by Grant Lee Buffalo. And especially to Truly, Truly and Everybody Needs A Little Sanctuary. And also The House At Pooh Corner, which I listen to nearly every week while doing the yarn photos, because no matter how many times I listen to it, it never fails to make me laugh. Thinking: about running. I’ve clawed my way back to my pre-xmas fitness, and am up to 2 mile runs now. My aim is to get to 5 miles by spring. Eeeeeek. Eating: Jamaican Rice & Peas. Made with coconut milk and kidney beans, but without the bacon. Mmmmmmmmm. Drinking: Lady Grey tea with a dash of milk (soy). The idea of milk in Lady Grey was yuck until I tried it, and now I’m a convert. Knitting: Cat Socks. Because I need some crazy socks in my life. 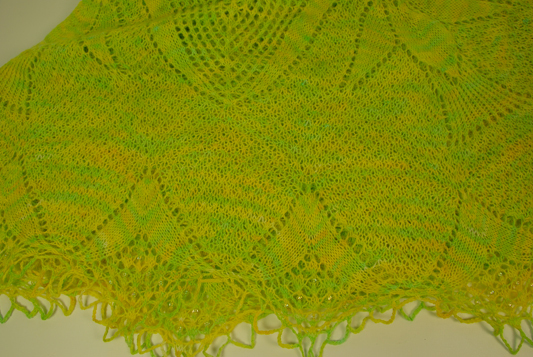 Tilia shawl. Tilia is the group which lime and linden trees come from. 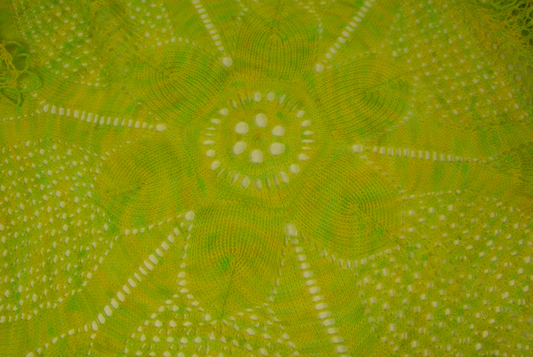 I chose the name because parts of the pattern look like lime leaves and lime flowers. The lime trees are flowering now, announcing that it’s spring. Lime flowers have been used to relieve anxiety and the linden tree is the tree of lovers in Germany. Meetings used to be held under tilia in order to restore peace to communities. A peaceful, beautiful shawl. There were some fabulous name suggestions, but this one really appealed to us and seemed to sum up the shawl design perfectly. Congratulations, 2ply!